Well, I did exactly what I wasn't supposed to do. 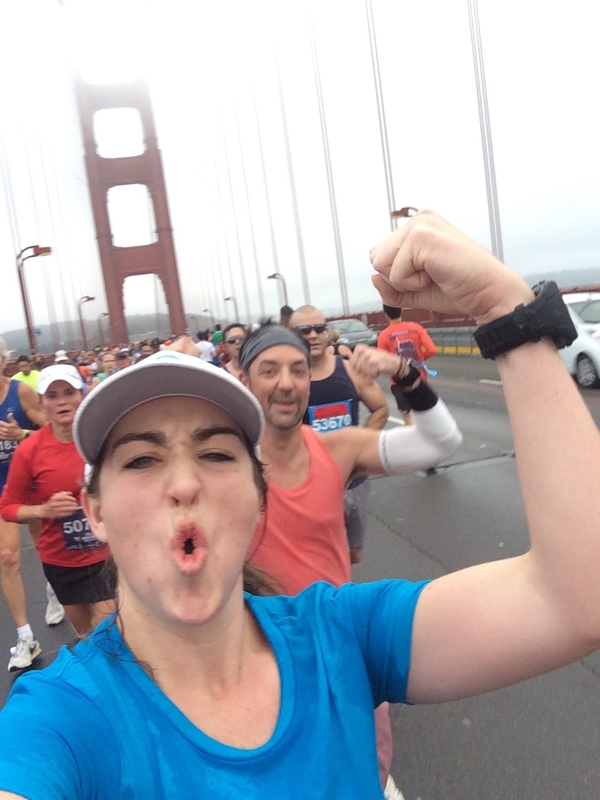 Because of my Fall race schedule, I decided to drop out of the San Francisco Marathon. Originally I planned to run the first half of the San Francisco Marathon with my cousin William. That was until I found out my cousin William had a goal time of 1 hour and 30 minutes. I can't run that fast if you paid me 1 million dollars to try so I chose to run with my good friend Gregg who was running the ultra marathon (52 miles!!!! EVEN though they got lost the night before and ended up running 54 total!). My plan was to run 20 miles with Gregg and then hop out of the race. Now my mistakes started the week of the race. I wasn't planning on running a marathon, I didn't taper and I didn't take stay off my feet the week of the race AND I ran 5 miles of hills the Friday before the Sunday marathon with November Project. On top of that, I ate terribly. The day before the race, we were running late for our Runkeeper sign making party so I skipped breakfast and had a cheeseburger for lunch. Then I had a delicious dinner and about a ton of cookie dough before bed. The morning of the marathon, I woke up at 3:30am (SERIOUSLY SAN FRANCISCO WHO STARTS A MARATHON AT 5:30AM!?!?!) and had half of an English Muffin and a banana. I didn't take an energy gel because when I run 20 miles I take one at mile 6 and a second around mile 12. William and I used the restroom and then I sent William on his way to go SLAY his first half marathon. (He ran 1 hour 35 minutes!!!!) and I went to go wait for Gregg to be ready to start his second marathon. We decided to hop in the very end of wave 3 and literally started the marathon by ourselves. It was the strangest start to a marathon ever! I've never crossed a start line alone! But I love running with Gregg because he's 5 times funnier than I am. Before we even crossed the start line he had me in stitches. This guy was already 28 miles in (The ultra marathoners got lost the night before and ran an extra 2 miles! COULD YOU IMAGINE!?!?!) and he was smiling like it was going out of style. The first 5 miles of the race were beautiful. Right along the wharfs and the sun was just beginning to rise. The weather was perfect, super foggy with a slight wind to keep us cool. 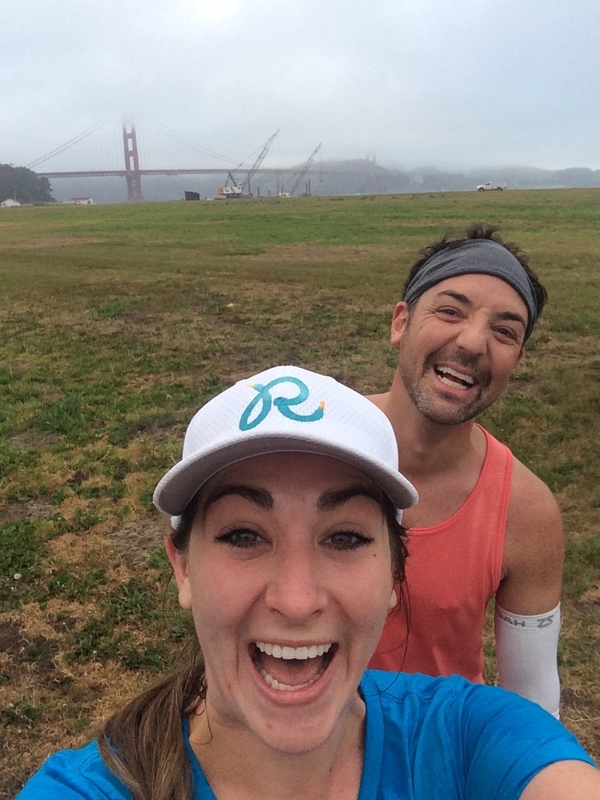 The worst part of the race was the Golden Gate Bridge. It was awful, wet and slippery, over crowded, people weaving and the bridge never ended. I hated running that bridge and I hope I never have to do it again. I told Gregg I was there for him so whatever he needed I was game to do. We walked the hills (Which let me just say, running a marathon with walking breaks was WONDERFUL! I highly recommend it.) There were some serious hills in this race but not nearly as much as I was expecting. But that may be because we weren't running them. Either way, I was a happy camper. My only goal was to keep Gregg smiling. Once we got off the bridge I could see just how hard that Ultra Marathon was so I made the decision to stay with Gregg and do the marathon. Had we not been maintaining a 10+ minute mile pace and taking walking breaks, I would have ducked out at mile 20 like I had planned. But I wanted to be there for him and I would have felt awful leaving him. He was the reason these past four months were a breeze and he's probably my most supportive friend so I had to return the favor. I will say, I never would have thought a day would come that I would casually decide to run a marathon to support a friend. That was a sobering moment. Here's what made this marathon really special, all the people we met. If you've never had the pleasure of running with Gregg Bard, you're missing out. He talked and supported everyone on that course and we met so many first time marathoners along the way. It was an experience I will never forget. One woman especially, we were in Golden Gate Park around mile 15 when I was dancing and acting crazy -- she asked me how I had so much energy. We all got to talking and she told us this was her first marathon. Gregg launched into inspiration mode (Because that's just how he is, even when he's steps away from exhaustion he is always focusing on the people around him) and she started to choke up. It's so easy to forget how much of a struggle our first times were. MINE WAS AWFUL! I AM CRINGING JUST THINKING ABOUT IT! But I wouldn't have made it had complete strangers not of checked in with me and encourage me. ), It's so important to watch out for and support one another. I love the running community because everyone has something to fight for. The reasons may be different but the drive and passion behind them is all the same. We all worked through serious walls to make it to the finish line. It's really hard to do it alone and honestly, you shouldn't have to. The pats on the back, the "You got this!" and the "How are you doing? You're looking great." -- they really make things so much easier. At the risk of sounding like a total A Hole, this was the easiest marathon I've ever run. It was literally a walk in the park (Mostly because we spent a lot of time walking in the park) but it was really very special to watch Gregg cross that finish line and to meet so many wonderful people along the way. I am smiling just thinking about it and it meant so much to me to be able to meet so many of you along the way. I've never run a race like that before where we just chatted with everyone around us the entire way! I have absolutely no regrets about running the marathon. None. It was the best decision I've ever made. To everyone I met in San Francisco, thank you for all the support and kind words. I'm tearing up just thinking about this weekend. I never dreamed I would be in the position I'm in. I never expected to have this online social community. The impact it's had on my life is not lost on me. To everyone who came up to me this weekend and to all of you on Instagram, Twitter and Snapchat -- THANK YOU. It's so cool to be able to get real time support from all of you during the marathon. I spent miles reading everything to Gregg as well, you don't understand how helpful it was to him.